The fastest growing technology companies in Australia are capitalising on a payment and services revolution across the country, delivered through cloud-based solutions. Unveiled amid a bumper crowd in Sydney, the 2018 Deloitte Technology Fast 50 Australia Awards highlighted the local businesses leading the way through innovation, delivering more than $1.5 billion to the economy as a result. Specifically, winners were selected following an assessment of revenue growth over a three-year period for companies with minimum cumulative revenues of $8 million. ‘Retail therapy’ champion, Afterpay Touch Group, claimed two major prizes, topping the list with average revenue growth of 8,134 per cent over the last three years, as well as winning the Leadership Award. Mate Communicate placed second with 3,703 per cent growth, while Superloop came in third with an increase of 1,860 per cent. Rounding off the top 10 was Vamp (4 - 1,285 per cent); Zip (5 - 1,245 per cent); Swift Networks (6 - 1,211 per cent); Koala (7 - 1,022 per cent); PEXA (8 - 757 per cent); Truck Dealers Australia (9 - 685 per cent) and Megaport (10 - 637 per cent). Other notable winners included Cevo (14 - 461 per cent); Adactin (16 - 403 per cent); Prospa (20 - 308 per cent) and Araza (28 - 200 per cent), alongside Skyfii (32 - 164 per cent); Idea 11 (36 - 137 per cent); Over the Wire (40 - 127 per cent) and Venn IT Solutions (43 - 114 per cent). Meanwhile, cloud-based technology provider Barhead Solutions was named the 2018 Rising Star. According to Kimberly Chang - leader of technology, media and telecommunications at Deloitte Australia - Afterpay’s result was one of the “strongest” in the eighteen-year history of the awards. “We congratulate Afterpay from an outstanding field of Australian business innovators, who collectively drove revenues of over $1.5 billion for the Australian economy last financial year,” Chang said. The brain-child of young Sydney entrepreneur Nick Molnar and Anthony Eisen, Afterpay launched its reverse lay-by model in 2014, changing the way people pay for shopping and exporting the platform to thousands of retailers and millions of customers across the globe. Western Sydney also emerged as a force through the Smithfield-based NBN internet service provider Mate Communicate, which secured second place overall with its ‘backyard’ call centre and community first approach. The business finished ahead of the Bevan Slattery-led connectivity specialist Superloop in third place. Slattery becomes the first entrepreneur in awards history to have two businesses make the top 50, with Megaport (637 per cent) coming in at number ten. According to Josh Tanchel - Technology Fast 50 Lead Partner at Deloitte - the recent political and media interest around Technology Fast 50 companies such as Afterpay and Zip (1,245 per cent growth) highlighted the “positive impact” such businesses are making in "challenging traditional models and corporate philosophies". “Companies like Afterpay, Zip, Prospa and MoneyMe are genuine success stories for Australia and reminders of how fresh thinking fintechs are fundamentally changing the ways we pay for goods and manage our finances,” Tanchel said. “In some ways it’s not surprising, that they attract attention in the current environment, but, as we saw with another Technology Fast 50 company, Prospa, last year, the good models do withstand scrutiny and deserve support. From a sector perspective, the Technology Fast 50 comprised 24 per cent fintech (including insurance); 22 per cent software; 20 per cent IT and communications; 18 per cent online; 14 per cent digital agency and two per cent medical. NSW headed the list of companies in 2018 with 27, ahead of Victoria (11), Queensland (10) and Western Australia (2), while 74 per cent of businesses were private and 26 per cent listed. “This year’s list tells us that we are going to see further challenges to traditional finance models from the fintech sector and serious growth in AI development, in 5G telecommunications and in the implementation of cloud-based business systems,” Tanchel added. This year also played host to an emerging wave of female tech entrepreneurs among Australia’s fastest growing technology companies, with nine women founders or co-founders making the list. “Excitingly, 2018 sees a significant number of women as successful technology entrepreneurs across a range of fields in both the Technology Fast 50 and the Rising Star categories,” Chang added. For Tanchel, this year’s awards again showcase an array of individual Australian success stories, from garage and living room based start-ups to established industry leaders pursuing new ideas. “Business ideas include everything from high-level consultancies to a new approach to sanitary wear that is building international markets,” he added. 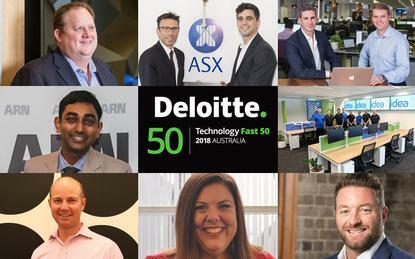 The Deloitte Technology Fast 50 Awards are the longest running of their type in Australia and provide international recognition for Australian innovation, with the winners gaining automatic entry into the Deloitte Asia Pacific Technology Fast 500 program.